A few weeks ago my sister Lola came down for a visit and, being the Rosenbergs that we are, decided we most certainly must make tortillas…from scratch. Because that’s what we do at 2 p.m. on a weekend when there’s nothing better to do. Luckily, I had picked up some really lovely masa on a recent trip to Houston for a friend’s wedding. On our drive to the airport heading home, I made Daniel turn off the road at the last second so we could shop at this giant Latin market. Well worth almost killing ourselves, I’m sure. J/K. So once inside I of course had to visit every aisle and, without a cart in hand, started stacking everything up in my arms. My arms were le tired. All in all, I picked up some awesome local (or near local) foods, the bounty of Texas! 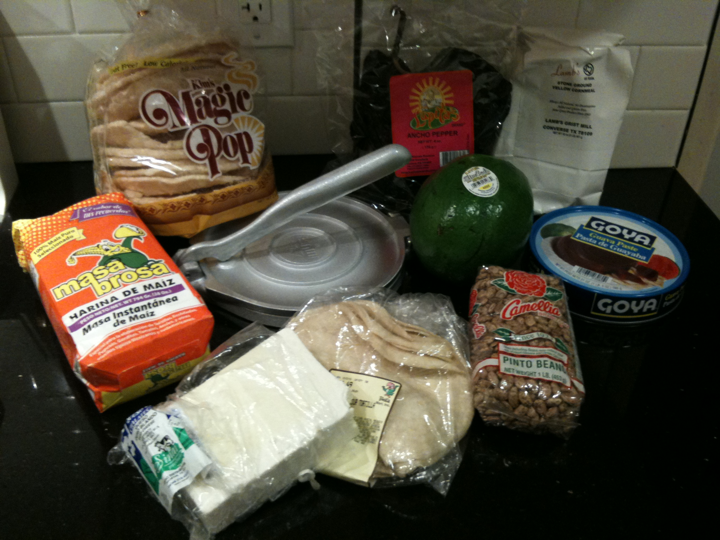 including: stone ground cornmeal, pasta de guayaba (sweet guava paste, often eaten on crackers), pinto beans, fresh baked tortillas, queso de blando (a hard, kind of barnyard sheep’s cheese), masa, dried ancho peppers, a giant avocado, magic pop crisps and a new tortilla press. The tortilla press came in quite handy for our little tortilla-making session. Mix thoroughly in a large bowl (a big spoon worked well) until mixture resembles a dough ball. Feel free to add a little more water if needed after you’ve stirred for a minute or two. Once mixed, pinch off dough into about 2 inch balls, roll in your palm and place in the middle of the tortilla press. I line mine with wax paper so I don’t have to spray each side with oil. Press down firmly and lift. That’s it, you’re done, you’ve made the first tortilla in your previously handmade tortilla-free life! And you thought tortillas were hard to make. Lola and I made about a dozen tortillas in 15 minutes. Stack your fresh tortillas with sheets of wax or parchment paper in between so they don’t stick as you heat up your pan. I repurposed my pancake pan for this, just spraying it with a little oil before I put on a new tortilla. Cook on each side for 20-30 seconds, then remove to a warmed plate covered with a towel. The steam in the tortillas will be retained in the towel and keep the tortillas moist. 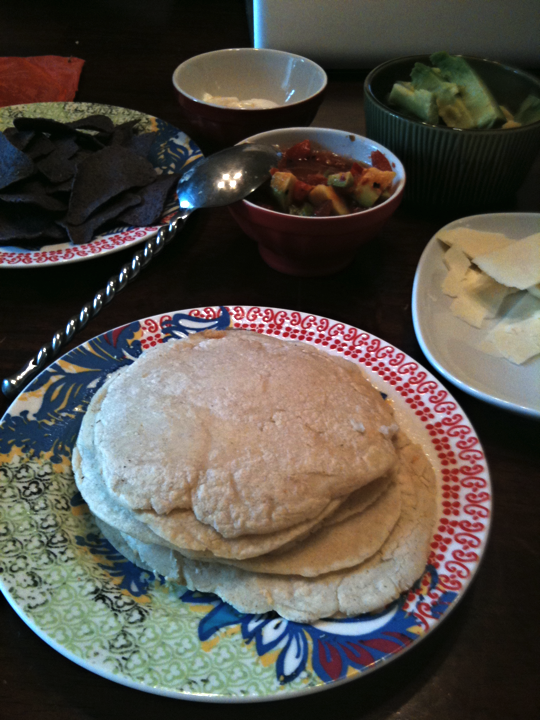 Well, we downed those dozen tortillas in about as long as it took to make them. I made a homemade, chunky quacamole with the giant avocado and we sliced off some queso de blando into thin strips so it would melt a little on the warm tortillas. Next time you’re bored on a weekend afternoon, try making tortillas. Your friends will be totally impressed and you’ll have another fabulous tool in your kitchen arsenal…the skill, I mean, as well as the tortilla press, of course. Lord knows I have too many gadgets in my cabinets!